Red (which stands for Retired, Extremely Dangerous in case you were wondering) is a fun film with seasoned actors who do a great job. It isn’t the standard shoot ‘em up action films which makes it even more enjoyable to audiences of various ages. Every wonder what happens to old spies when they retire? Do they sit around reliving the "glory days"? Do they take up hobbies such as painting and needlepoint? Or do they spend their days at target practice hoping for one last job to keep things exciting? For former CIA agent Frank Moss (Bruce Willis; Die Hard) it's none of these things. Instead, he likes to rip up his retirement checks so he can call the helpful civil servant worker on the other end of the phone and chat with her about her life and the most recent books she has read. For said worker, Sarah Ross (Mary-Louise Parker; The West Wing), those phone calls are a bright spot in her otherwise mundane job and boring life. Moss lives a simple life until one day when we realize something is amiss. His instincts serve him well as a team of assassins send a barrage of bullets through the front of his house. Moss manages to escape and his first stop is Ross's apartment since he realizes she is in danger too. Meanwhile, current CIA agent William Cooper (Karl Urban; Star Trek) is hunting Moss and his colleagues in an effort to exterminate them. Moss and Ross head to New Orleans where Moss checks in with his friends Joe Matheson (Morgan Freeman; The Shawshank Redemption) and Marvin Boggs (John Malkovich; Empire of the Sun) who are also on the "list". It seems back in 1971 they helped to extract someone on a secret mission and that person now wants everyone dead. Moss, Matheson, Ross, and Boggs end up on the run and enlist the help of former MI6 agent Victoria (Helen Mirren; Eye in the Sky) in order to solve the mystery of who wants them dead and why. This film has it all… a great cast, a good script with humor infused throughout and action. Willis, Freeman, Malkovich, Parker, and Mirren are all superb and make the film so much more than it would have been with other actors in those roles. Their chemistry and banter are great which is really what makes the film gel. The only issue I have with casting is that Parker seems so much younger than Willis making their "romance" a little awkward (when in reality he is only 9 years older than her). The action is well-balanced and mostly realistic with a few exceptions. When Moss's house is bombarded with gunfire in the evening hours none of the neighbors even look out their windows let alone come outside to see what is going on. Really!?!? That makes no sense at all. The 4K Blu-ray is 2160p quality video with an aspect ratio of 2.40:1 and an H.265 HEVC codec. The transfer is well done and the picture is clear and clean with great shading and vibrant colors. The Dolby Atmos audio is one of the best features of the film with special effects using the full spectrum of the side channels surrounding the viewer in bullets and bombs. The Combo pack offers only minimal extras including commentary from a former CIA agent that is broken into "chapters", deleted scenes and a theatrical trailer. The Commentary is different from the usual and offers terrific insight into the CIA. Red (which stands for Retired, Extremely Dangerous in case you were wondering) is a fun film with seasoned actors who do a great job. It isn't the standard shoot ‘em up action films which makes it even more enjoyable to audiences of various ages. Download Red from the iTunes Store in Digial HD. 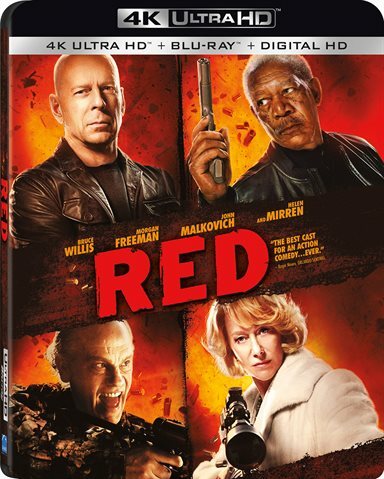 For more information about Red visit the FlickDirect Movie Database.